And meteorologists agree there is a chance of the icy blasts arriving in the early hours of tomorrow morning, especially in high parts of the UK. Coral is offering odds of 10-11 for wind speeds to hit 100mph. Spokesman John Hill said: “It is going to be a blustery back end to the week where the betting suggests the wind speed could reach as high as 100mph in the mainland UK. “The odds also have been cut on this month ending as the wettest February since records began as we are set for a lot more rain over the next few weeks”. Coral is also offering odds of 1-2 on it being the coldest winter on record in the UK, as well as 6-4 on it being the wettest February. Storm Erik is rolling in from the Atlantic Ocean, and is expected to bring gale-force winds of 70mph with it across the UK. The Met Office has issued severe wind warnings for Scotland and Northern Ireland on Friday, extending the warning extending to parts of England early tomorrow. Already one person has been killed by Storm Erik after a tree fell on their car in Devon this morning. Erik is likely to cause further chaos and power cuts across large parts of the country. 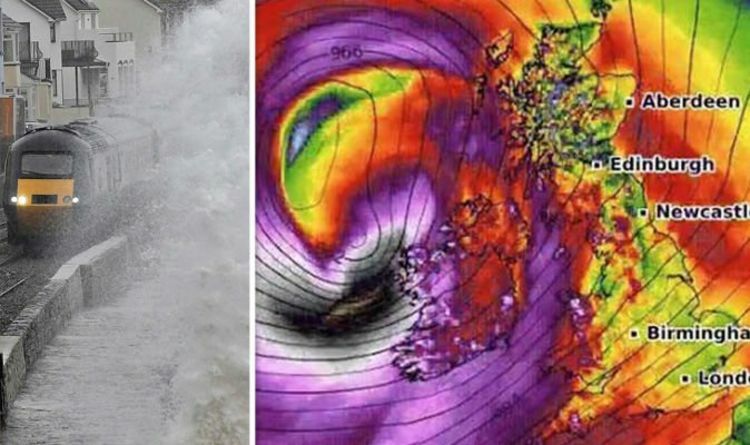 A Met Office spokeswoman said the strongest speeds recorded so far which are associated with Erik were 84mph in Capel Curig, North Wales, 69mph in Killeen, Northern Ireland, 64mph in Needles on the Isle of Wight and 63mph at St Mary’s Airport on the Isles of Scilly. She added: “Looking at the model data there is a small possibility that we may see gusts reaching 100 mph in very isolated spots such as Capel Curig (Snowdonia) in the early hours of Saturday morning and during Saturday daytime over the Cairngorms. “It is important to note these are both high level, exposed sites where you would expect to see the strongest gusts. “It is not that unusual to see wind gusts of 100 mph in the UK – we often see these over high level sites such as mountains in Wales or Scotland. Speaking yesterday, Met Office Chief Meteorologist, Will Lang, said: “Southwesterly winds will strengthen across the UK on Friday, so it’s going to be a windy day for everyone. “The good news is Sunday will be a less windy day for most of us as Storm Erik moves towards Scandinavia.